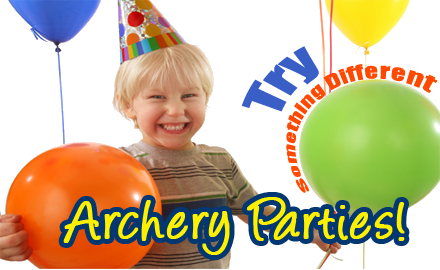 Archery Birthday Parties Winnipeg | Heartland Archery - Heartland Archery | Winnipeg Archery Range, Lessons, Leagues, Parties & Shop! Try something different for your child’s birthday party this year! Every kids love an Archery Birthday Party! Heartland Archery has complete birthday package options! Archery parties are suitable for kids ages six and up. Are you looking for Winnipeg birthday party ideas? Archery birthday parties are a great idea! We even saved you the trouble of making invitations! Spots do fill very fast! We recommend booking as far in advance as possible. Please have a credit card ready when booking; this is required to hold your reservation. It will not be charged unless a $20 no show or late cancellation fee applies (Cancellations or modifications must be made prior to the Thursday before the party) . Your kids will arrive at Heartland Archery and receive a brief explanation on how the range works and how to shoot a recurve bow and arrow. They will then begin shooting and an instructor will remain with the group the entire time! Many different types of games will be run, balloons popped, 3D shooting and more. This will last for one hour and then you may take the kids home for their cake and ice cream. All equipment and instruction is included. DUE TO STAFFING REQUIREMENTS A MINIMUM OF 8 ARCHERS PAID FOR IS REQUIRED BUT MORE OR LESS ARCHERS CAN BE ACCOMMODATED. We also have a limit of 8 kids for parties of 6-7 year olds. Our second birthday party option allows everything to be taken care of here at Heartland. It includes the shooting part in option one and once they are done shooting they will go upstairs to a party room where we will serve pizza, ice cream and pop. Cake is not included. The kids can bring all their presents and open them here and you will have NO mess to clean up at your house! $17.00 Per participant, $7.50 per person only having pizza. Same package as #1, but use of the party room is added. Pizza, pop, and ice cream is included! All you need to bring is the cake! $17.00 per participant, ($7.50 per person only having pizza) and $7.50 per goodie bag. Total for archery, pizza and goodie bags $24.50 per participant.